I hope you're all having a wonderful day. 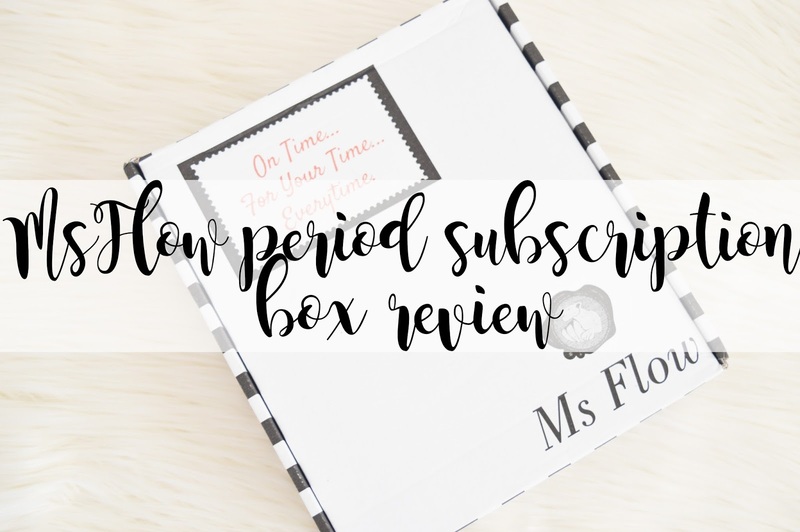 I was recently sent the Ms Flow Period and Wellbeing Subscription Box to try out and review and I'm really looking forward to sharing my thoughts of it with you. I absolutely love the idea of this subscription box. I even mentioned it to my brother and he asked me how he could get one for his girlfriend, he thought it was a brilliant idea. This is a perfect subscription box for all you ladies for when it's your time of the month. Or even for all you gentleman who want to comfort the lady in your life; this is the perfect way to do it. I would be so happy if my boyfriend handed this to me to be honest, it's everything I need to feel comfortable (of course I also need pyjamas and my bed with a large fluffy blanket and socks). Ms Flow really know how to make us girls feel better by including everything we need every month in one small box. I have to say, this is also a beautiful box! The first item in the Ms Flow Period Subscription Box is the Birch Lea Soaperie Orange and Rosemary Bath Tea. I can completely understand why they have included this item into the subscription box. The one thing I always want when I'm on my period is a bath to comfort my stomach cramps however I do not have one so I have to suffer or swap for a hot water bottle instead. These smell absolutely incredible! If you love a bath, you'll definitely love these in it. If you want to pick this up and you didn't subscribe to the subscription box then you can find it for only £2 from their website! The next item is the Time Bomb Hand to Hand Combat Hand Cream. I always need hand cream where ever I go and this is one to add to my collection. You can pick this up for £7.25 from the TimeBomb website. I really like the smell of this hand cream. It's not too strong and I've found when I'm on my period scents are a lot stronger than what they usually are so it's nice to be able to wear a hand cream which isn't strong in fragrance. Unfortunately I'm unable to link this item to purchase it as individual however Ms Flow have their very own candle which they bring out in each month's subscription box which is a way of giving the box it's own little personal touch to the brand. This is in the scent Mamosa and Mandarin and it's a very subtle, fresh yet sweet scent; I really like it! I love how Ms Flow include some sort of makeup product and in this subscription box they included a Bella Pierre Eyeshadow Shimmer Powder. I had never heard of this makeup brand before trying out this subscription box and I keep thinking about heading to their website to try out more of their makeup as they are a mineral makeup company which you very rarely find. This is such a beautiful and natural shimmer too which is what you want when you want to look better than you do but at the same time, you really do not want to wear a lot of makeup. Of course one thing every girl needs when they're on their period is chocolate! I'm writing this and all I want is chocolate but as I'm ill with food poisoning too (at least I think it's food poisoning) the last thing I want right now is chocolate. I love how they also chose caramel milk chocolate, this is definitely my favourite and it's a fair trade brand too! Another favourite when I'm on my period and also during Winter time anyway is hot chocolate's and Ms Flow has included a fudge hot chocolate, oh my god! I haven't actually drunk this yet and I think once I'm feeling better, this is definitely going to be the hot chocolate which I reach for first. I can imagine this tastes absolutely incredible! Is anyone else craving chocolate right now? I know I am. Ooo Jelly Beans. I love Jelly Beans however my favourites are the Jelly Bean Factory not Jelly Belly, however my brother did enjoy these for me! Something everyone needs when they are on their period is something sweet and Ms Flow has sorted this by also providing a tiny packet of jelly beans. I'm not entirely sure what the flavours were in this packet, but it should have said Harry Potter on the front as they did not taste normal! I'm not a lover of tea, I'll admit that! And I have never had a bedtime Tea either so part of me really does not want to try this! However, there are so many people out there who always need a tea before they go to bed. Let me know if you are one of these people! Ms Flow has helped you with this craziness by also including a wonderful Yogi Tea Bedtime Tea for your cravings. And last but not least is of course sanitary products! Ms Flow actually personalise the Subscription Box and when you're creating your order you can decide which brand you prefer, whether you prefer Tampax or pads and they'll create the box suited to your needs. For the purpose of reviewing they kindly sent me a variety of different brands and sizes. I never knew how many different types there were on the market until I received this! Do you suffer on your time of the month? What do you do to make yourself feel better?